FTC disclaimer: I received a copy of this book in exchange for a fair and honest review. All opinions are my own. Have you ever read a book that parts just don't seem to apply to you? Have you ever read a book that you feel like the author is speaking right to you? This is one of those books. In a very creative style of addressing parenting style, Michelle Anthony speaks to nearly every type of parent. This book has a twist, though. Instead of telling you to change, she gives suggestions on how to give yourself and your fears to the Lord so that you will eventually change as your trust in Him grows. Oh, but perfection is something that I always have strived for. I remember when I was in high school I had a chart that I could check off and see how good of a Christian I was that week. I thought of that as I was reading the chapter "Beyond Good Behavior and chore Charts". I had the good behavior, but unfortunately those around me hadn't encouraged me in faith formation, but left me drowning in moral education. There's a difference, and the approach could mean your child staying with your faith or abandoning it once they are on their own. 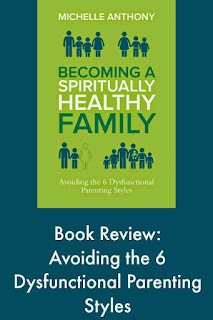 I recommend this book to anyone who is a Christian and is a parent of children living at home -- or anyone thinking of having children. She even gives great help in developing a family mission statement. Who couldn't use that? It's an idealistic goal to have a family mission statement, but let's face it, they feel impossible to write and they just get pushed aside for another day, which never seems to come. This book is chock full of encouragement, great ideas, and gentle reminders that you guide your children and that guiding them doesn't mean micro-managing, being absent or even driving them towards perfection. Even though you might be the criticizing parent and feel the I-cant-say-no parenting style has nothing to do with you, I still encourage you to read the section about it -- you might surprise yourself what characteristics you do have. Also, there are great little nuggets of wisdom throughout the book and you don't want to miss out on any of them!